The list of previous parts is at the bottom of the article. In 1958, as a part of the defense materiel plan for the 1960s, it was decided that the Swedish army should acquire a new tank to replace the Centurion. This was more or less a response to the development of the new generation of tanks in the west, such as the Leopard 1 and the Chieftain. Although Sweden had interest in these foreign designs (most notably the Chieftain), it was decided that a native design would be preferable. Based on different ideas about tank development at the time, these designs were categorized as three different classes of tank. 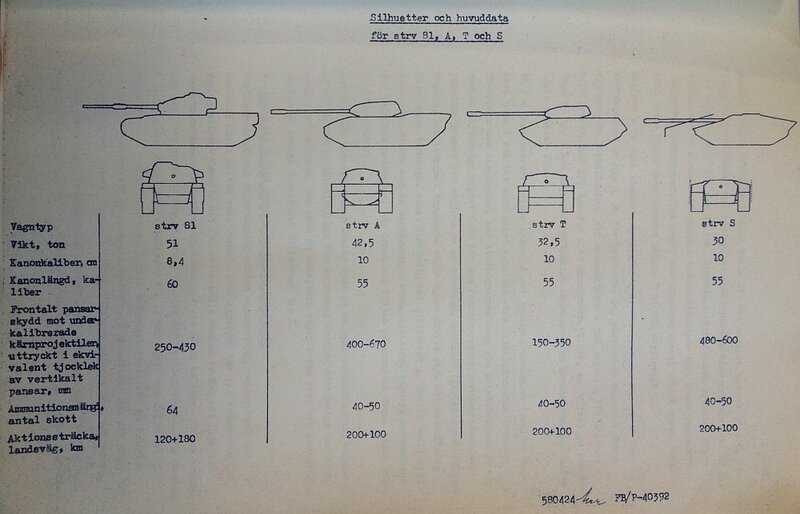 However these were not just categories for foreign tank designs, but these also became the basis for three Swedish proposals called Strv A, Strv T and Strv S.
From these proposals, the army quickly came to dismiss the concept of the Strv T, as the army had lost its belief in lightly armored vehicles after the acquisition of the Centurion in the early 50′s. This meant that the Strv T never really went into development and work on that concept was cancelled just a few months after it was proposed. The Strv T was to be a highly mobile tank with a weight of 32,5 tons and with a power to weight ratio of 25-30 hp/t. The main armament was shared between all the proposals and was to be a high performance 105mm rifled gun (pretty much equal to the L7). The armor was designed to withstand 57mm anti-tank weapons and reached a maximum of 75mm at the turret front with the hull being 40-50mm thick and the rest of the hull at 35mm thickness. With the elimination of the Strv T, two concepts remained and it was decided to continue the development of both, as there were still doubts whether the S tank concept could work. The Strv A was to be the Swedish response to the British Chieftain and American M60 Patton. The tank was to weigh 42,5 tons and would have a power to weight ratio of around 20hp/t. The engine that would have been used for the tank would have been a version of the SFA F12 engine, developed as a part of the now cancelled EMIL heavy tank project, however this engine only produced 723hp, so the actual power to weight ratio would have been closer to 17hp/t. The armor of the tank was to protect it from anti-tank shells of up to 12cm caliber at the front and would, according to most documents, be up to 150mm thick, although – when the weight calculation for the armor was made – it was decided that a maximum of 120mm would be used, so the 42,5 ton weight limit would not be crossed. This resulted in a curved hull front with armor 100-120mm thick and turret armor of 100mm at the gun mantlet, with the rest only 60-50mm thick. The sides of the vehicle were 50mm thick and rounded to provide better protection, the rear of the hull was 50mm thick as well. The armament was the same 105mm gun as on Strv T, but with an autoloader fed from two 20 round magazines, located in the hull. Initially, it was planned to use two piece ammunition with a rate of fire of 8 rounds per minute, but in 1959, the ammunition was changed to one-piece ammo and the rate of fire was increased to 20 rounds per minute. I should also mention that as a response to the American T95E6 medium tank, it was suggested that a heavy gun tank version of the Strv A with a 120mm gun should be considered, although this never went anywhere. It was however noted that a 12cm gun would reduce the amount of ammo and only increase the survivability of the tank marginally. 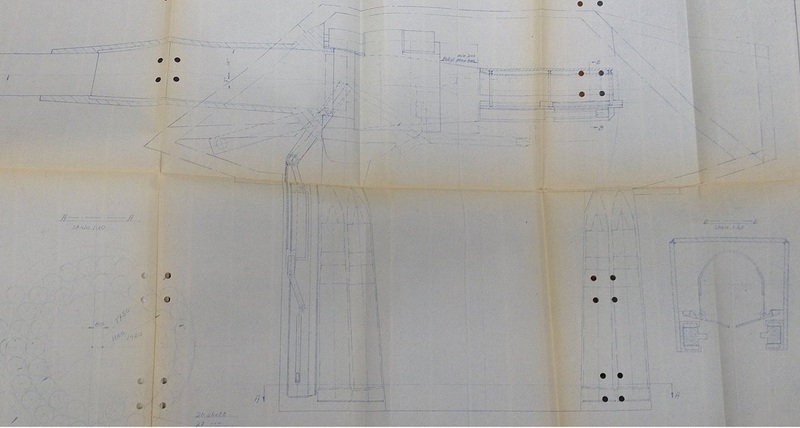 We have documents that tell us that the development of the autoloader and the A tank concept continued well into 1959, however by 1960, the concept of the S tank had been tested on various vehicles and it was decided to discontinue the development of the A tank. Eventually, some concern over the S tank project would arise, but the A tank was never considered again – instead, the Chieftain would take its place as the turreted competitor to the S tank. In the end, the S tank was chosen as the next Swedish tank for better or for worse, but that is a story I’m saving for the next part. There is however one more project I want to cover before I end this part. In 1958, before the Swedish purchase of the Centurion Mk X, a proposal was made to fit the turret of the Centurion Mk X to the hull of the prototype “Kranvagn” chassis, that had been produced as a part of the Swedish heavy tank project. It is unknown whether this was to serve as a test bed for future turreted Swedish tank concepts like the A tank, or whether this was to create a competing design to the Centurion Mk X. In any case, the plans never went anywhere and the hull ended up being used as a S tank test bed instead. Personally, I have dubbed this vehicle the K tank, as this was the designation given to the “Kranvangn” hull at this time (1958). In the game, these tanks could fill the role of high tier Swedish medium tanks, the only problem is that they are very much paper projects. Personally, I have placed the Strv K as the tier 9 medium tank leading up to the Strv A at tier 10. This would mean that at tier 9, we would have a pretty well armored, but also mobile medium tank with the turret and gun of a Centurion although likely with quite bad soft stats. This would lead up to the tier 10 Strv A, that would play unlike any medium in the game with decent mobility and hull armor but with an autoloader and bad turret armor. I think that this could make for a very interesting play style (something akin to the AMX 50B?) that is completely different from other medium tanks currently in the game. Then, there is also the T tank, which I have as a tier 9 medium tank to end of the Swedish light tank line and connect to the Strv A at tier 10. However very little is known about the T tank so I wouldn’t be surprised to see it being ignored or reduced to the role of clanwars reward tank. However it could work at tier 9 or 10 as a more lightly armored Leopard with worse gun depression but possibly better or equal mobility. In any case, I hope this gives you an idea of how these vehicles could work in the game and I hope you enjoyed reading. These Swedish tank articles have all been very entertaining to read. Thank you. With length, we’re talking about hull length, right? I suppose those autoloaders would weight quite a bit….. and the hull height at 1.75 m is pretty high considering it is only 2.53m in total. I assume the fourth line in the comparison table is the effective frontal armour of the respective tanks, correct? Do I understand it correctly that the RoF of 20 RpM could be sustained until all 40 rounds were fired? That frontal armor of the S tank looks amazing with 480-600 mm of effectivr armor. The sad thing is that they did a test of the HEAT protection in the front with a russian T-72 fireing and the result was that the shell ended upp in the rear pf the S tank, it went rigth thru it like if it was butter. I look forward to a Swedish tree due to their unique designes that translates into new gameplay and tactics. Sounds like fun, a souped-up AMX 50B with less armor and a bigger clip… 4 minute reload time for 20 rounds of 105mm lolz would result in more hunting in the first 4 minutes than ever seen before in WoT… and probably 10 of these with 5 other tanks to stall until they’re loaded per team… until it’s realized the stallers are making more XP/creds/WN8 than the 20-round clip guys and people start switching back. It WOULD accelerate batle pace by a GREAT deal though… and make most heavies totally obsolete as 20x Tier 10 105mm HEAT would make their armor totally useless (Maus/E-100 UFP aside). No, I am not dumb enough to think they’d actually do this. Best we can hope for is a slower, less agile, more armored Bat, much as the T57 is a slower, less agile, more armored (turret-wise) 50B. Cause, after an paper T57H that blows out of the water the actually produced AMX 50B, we totally need another paper project that totally blows out of the water, the actually prototyped Batchat. Reminds me the Autoloader upgrade for Chinese “Battlemaster” tanks in CnC Generals.